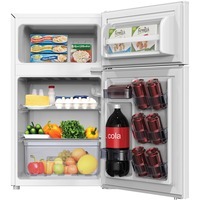 Avanti RA3106WT 31CF 2 Door Refrigerator AVARA3106WT $365.99 This compact refrigerator offers full range temperature control in a two door design. Additional storage space in the door lets you hold up to five 12 oz. cans to optimize your space. Clear view crisper keeps your fruits and vegetables fresh. Compact refrigerator features a separate freezer section that has its own door for a better way to keep your frozen foods separate. Perfect for dorms or areas where space is limited, this 3.1 cubic foot refrigerator features a reversible door that adjusts to open to the left or right. Compact refrigerator also features two liter bottle storage, door bins, space saving flush design and recessed door handles. Refrigerator is ADA compliant and Energy Star qualified.